No one has ever died on the exposed section declares our boat guide en route to the Crypt Lake hike in Waterton Lakes National Park in southern Alberta. Would you call those reassuring words as you headed out to test your mettle on what has been called the Indiana Jones adventure of the Canadian Rockies? 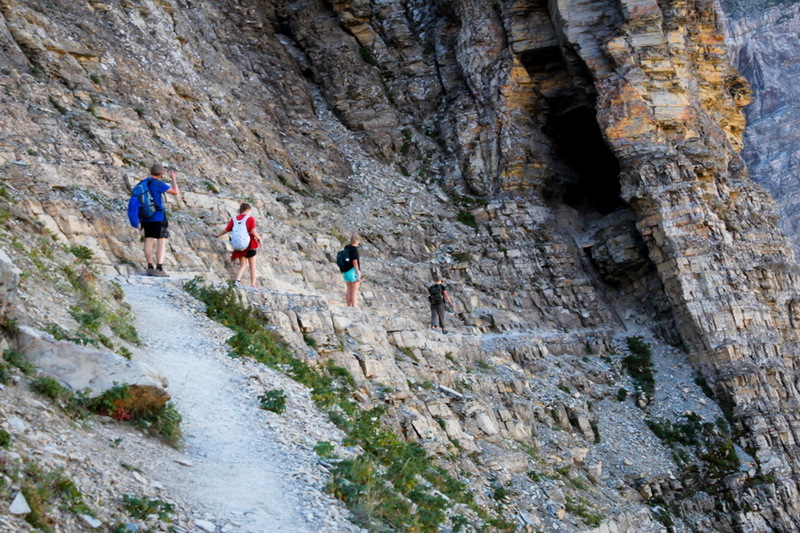 Have you ever hiked the Crypt Lake Trail? Would you want to? I don’t think so. I really didn’t know what I was getting myself in for. But the one thing I did know was that I was not alone. John and I joined the throngs (we’re talking a few hundred here) of other hikers vying to hike the Crypt Lake Trail on the Sunday of Labour Day weekend. It’s a trail that packs a lot of excitement and adrenaline hits in only 8.7 kilometres (5.4 miles) one way – and you get those adrenaline hits not once but twice if you want to get back to the boat. The Crypt Lake Trail starts off a little differently than your average hike with a 15 minute boat ride as the first order of the day. This is when it first strikes you that you won’t be alone on the trail. For some that will be a positive thing since this is bear country after all. But if you’re looking for the solitary hiking experience you won’t find it hiking to Crypt Lake unless it’s a weekday in September. 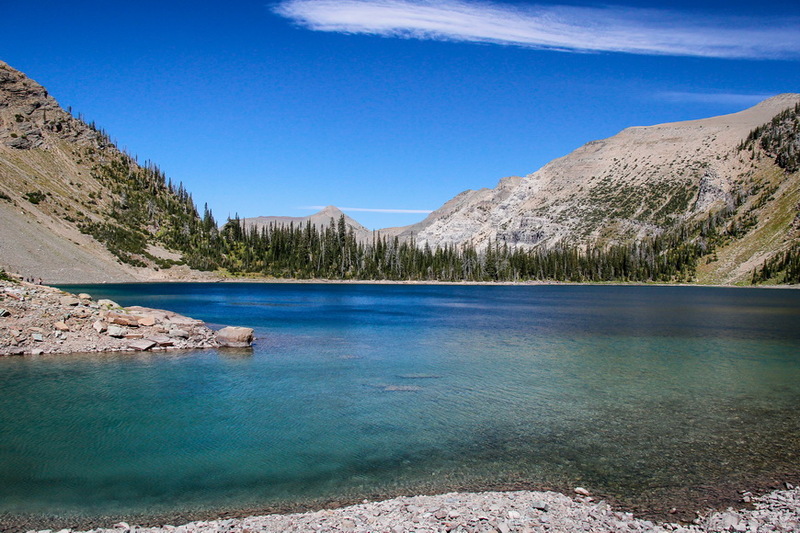 It isn’t the prettiest hike I’ve done in the Rockies – not by any stretch of the imagination but that’s not to say that it doesn’t offer up some glorious views and Crypt Lake itself is a beautiful Caribbean blue colour. Hiking Crypt Lake is really about going for the thrill of crossing a narrow scree slope with drop-offs – climbing an eight foot ladder, getting low and wiggling through a 20 metre (60 foot) tunnel and then scaring the living daylights out of yourself as you inch along the narrow rocky trail – with a steel cable handhold on one side and a drop-off on the other. Once you’re through the cable section, you can breathe a big sigh of relief. Or stop crying. But you do have to return the same way you came if you ever want to eat a hot meal again. Once you’re through the exciting section it will only take you 10 minutes to reach Crypt Lake. It’s super easy and enjoyable from here on. Crypt Lake itself is also a treat. Beaches line part of the lake – and because you likely have some time before you have to head back for the return boat trip, it’s a perfect place to lie out in the sun and relax. Or take the 30 minute walk around the lake – the far end of which is on the United States/Canada border and get a very different set of views. The route up to Crypt Lake is always easy to follow. On the way you’ll pass three waterfalls – Twin Falls, Burnt Rock Falls and the wonderful Crypt Falls as you climb a total of 690 metres (2,263 feet). You can also take a spur trail to Hell Roaring Falls near the beginning of the hike. It took us 2.5 hours to hike each way. On the return there was a lot of waiting required to let people pass who were still heading up on the cabled section. Factor that into your plans. I think the views on the way down were far superior to those on the way up – though maybe that’s because the lighting was better. If you get down to the lake before the boat arrives you can enjoy some lakeside R&R. That’s not a bad way to end such an exciting hike. You must reserve a seat on the boat. We bought our ticket down on the dock the minute the window opened at 8:15 AM for the 9 AM boat ride. You must reserve your return too. (You can do this the day before too.) We chose the 4 PM return and that gave us one hour at the lake plus 30 minutes to hike around it. We didn’t waste much time coming down. In peak season there is a 5:30 pm boat as well. The pricing is $20 per person. Contact the Waterton Inter-Nation Shoreline Cruise Company for the latest schedule. They can be reached at 403- 859-2362. Take a canister of bear spray. Wow! That was exciting and I was only reading about it. Did anyone get a little panicky or start crying? It would be understandable! Although I’ve never done anything quite like this, I think it’s the going back down that’s the scariest. @Cathy One woman was pretty distraught near the end of the cable section and I’m not sure how she managed getting down. I actually found it way easier on the return – perhaps because I knew what was ahead of me. Your photos are gorgeous! There’s so much great nature in Canada! I would, Leigh, if only to say I’ve done it. As I read, I was trying to remember if I’d ever done anything that would cause me to cry like that woman did. No, nothing came to mind. I imagine it was the cragginess of the rock and perhaps the drop-offs that unnerved her. The views are just absolutely breathtaking, though and well worth the trip. Would you do it again? You really captured the intensity and beauty of this hike, Leigh. That scenery is almost worth the thrill. Just the thought of those dropoffs and steel cables is enough to make me think twice about this hike. That poor woman – I guess she didn’t know what she was getting into? Kudos for making it through this hike unscathe and while taking awesome pictures. @Mary Scary for sure but so worth it. I really did feel badly for three women all in a row. I hope someone was there to help them return. @Kae Lani We are so lucky to have the diversity and the huge amount of wild space still left in Canada. What an awesome pay off…because I would be one of the ones crying with fear on the cabled section! @Deej I bet you wouldn’t cry though your body language might say fear. I love Crypt Lake, I’ve hiked it 8 times. I like the changing scenery it offers and of course the tunnel and the chains – that part is so much fun. I’ve also learned to be first off the book, hike fast for the first 15 minutes and then you’ll avoid most of the crowds from the boat, making it a much more enjoyable hike. @Laurel – We did just that after we got off the boat and got ahead of just about everyone too. I think we were the 4th or 5th people at the lake and we were on the second boat. Absolutely stunning! But I’m still not sure I’d have the guts to do this. I’d probably freeze half way up a mountain and need airlifting out! @Arian You might freeze …for awhile but then at a certain point you’d probably say to yourself I just have to go forward. And the guide did say that no one has ever died. Congratulations. Excellent photographs. While the adventure component is indelibly memorable, I also have vivid memories of the waterfalls on the way to the tunnel. @Barry I know the waterfalls with a 600′ drop were there – and yes they’re beautiful – but honestly I was concentrating on getting safely through the dropoff section. It is so sad but I have never really seen the Rockies. I would like to do some easy hiking as the views look gorgeous but none of that steep uphill stuff! @Ayngelina – Then the gorgeous and very easy Lake Oesa out of Lake O’Hara would be right up your alley or an easy hike to the Lake Agnes Teahouse above Lake Louise. Wow. I am almost speechless. The beaches around Crypt Lake was my favorite. Maris – Thank you. It’s an exciting though lovely hike and the beach is a bonus if the weather is sunny. Waterton is such an overlooked destination! Canada’s smallest National Park has everything going for it, except crowds. Well, it gets busy in the summer, but nothing like the other resort towns in a National Park. I think I might have to give that boat trip a go this summer now! Great article, love the pictures! Just wanted to point out that you went for your hike to Crypt Lake on the busiest “hiking weekend” of the season. It’s always better to hike on weekdays. 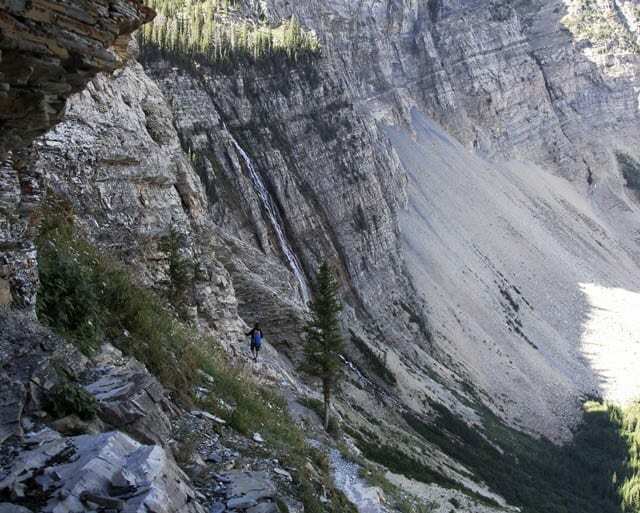 Trust me, I have been hiking Waterton Park for 27 years… and still love it! Even though it was the busiest hiking weekend of the year we managed to get away from the crowds by hiking quickly. The only hold-up was getting across the area with chains on our return as we had to wait for people still heading for Crypt Lake – and some of those people were literally paralyzed with fear. No matter what it’s a first class hike! @Jody You are so right about Waterton being overlooked. The other trails we hiked – on a Labour Day weekend – were practically deserted. The boat trip was great fun and something I bet your daughter would enjoy too. Thanks for sharing this blog. I do appreciate the post you’ve made here. @Madison Hope you find it helpful. If it is indeed this busy, would you recommend I try this trail solo? None of my friends are willing to do it with me and I have never hiked alone, but if there are that many people there I would assume it would be safe, and I right? I’m a slower hiker and would take the first boat out, so I would have people ahead of me and definitely people behind me. @Carolina I think if that is the case you’d have no problem going solo. Ideally do it on a weekend when you know there will be lots of people. Enjoy!